I completed the swim with my two younger brothers, Calum and Jack, and it took 02:22 hrs to finish. No human had ever swum across this stretch of water prior to our attempt. Alongside some of the most dangerous currents in the world, we had to navigate the risk of Orca Pods, Lionsmane Jellyfish and the threat of hypothermia from the Arctic temperatures. The whirlpool is called The Moskstraumen, and consists of a system of tidal eddies and whirlpools, one of the strongest in the world, that forms at the Lofoten archipelago, Norway, in the Norwegian Sea. It is located between the Lofoten Point (Norwegian: Lofotodden) of Moskenesøya (Moskenes municipality) and Værøy, at the small island of Mosken. As the Editor-in-Chief of the magazine that you are reading, I live and work in Berlin, where our office is located. I train at CrossFit Aorta and now at Berlin Strength as well. The vast majority of my swim training is done in the beautiful and scenic lakes that surround the city, and in the Olympic pool at The Europasportpark, where the forthcoming Berlin Regional competition will be held. When it came to training for this swim, this is what i did. The one thing that scared me the most about the swim was the cold. When you are submerged in cold water for longer periods of time, you can start to feel it seep into your bones. It can affect your mind and make you think very dark and negative thoughts. As Crossfitters and athletes yourself, you are very familiar with how important it is to be able to stay mentally strong. I wanted to make sure that i could survive the cold without letting it affect me negatively. In order to do this i took cold showers every day for 6 months before the swim. This was about as fun as it sounds, but after a few weeks it just becomes normal, and is actually a great recovery technique as well for efficient recovery after Crossfit training. It flushes lactate from your muscles and improves your immune system as well. I used many swim workouts from Chris hinshaw, and I made sure to have one long swim every weekend in the lake. I built this up over a period of several months, starting at around 500m and building up to a final 8km swim in Schlactensee in Berlin. I peaked this distance 3 weeks before travelling to the Arctic, then cut down the swims to 6, 4 and 3 km in order to maintain a good aerobic capacity without burning myself out. I also had at least one (normally two) other swimming sessions (always outdoors) where I worked exclusively and intensively on technique and breathing. During this time i used my Crossfit classes to add to my conditioning. I cherry picked workouts to favour longer conditioning pieces, as I was using Crossfit as a training aid to help be achieve a specific goal. Another great thing I learnt here was that for whirlpool swimming, there are a lot of unpredictable elements. your googles may fill with water, you may be sucked down into the water, or swept off into the wrong direction. But Crossfit teaches you to be exceptionally well prepared for the unpredictable. Do you ever have that feleing when you look at the WOD and you really don’t know if you are good enough to complete the workout? Yet somehow you manage it, and afterwards your confidence in yourself is improved? That feeling translated incredibly well to giving me confidence during the swim. There were times when I could feel the currents sweeping me off course, and all i could do was put my head down and keep going. In those moments I would think back to things that I had previously thought were impossible in WODs, yet I somehow managed to do in the Box, so there was no reason why I couldn’t complete the swim. The combination of Crossfit and dedicated swimming work was a great way to improve my mental toughness. I also learnt during the swim that Crossfit teaches you to focus exceptionally well. Perhaps it is the pain that makes you blank everything else out. During the swim we had spotters on the support boat looking out for killer whales. They feed in these waters, so there was a realistic chance that we could have met them during the swim. When you are swimming and you know they may be there with you, it is difficult to stay calm. but you have to, you have no choice because if you panic, then you will fail. I used what I had learnt at CrossFit Aorta, to focus on what i can immediately control, and to forget the rest. In a WOD that’s the barbell in front of you. In that moment all I could do was make make sure my technique was tight, my breathing was solid and i remained relaxed. That helped me to forget that there might have been very large whales in the murky icey waters beneath me! In terms of mental strength, you can never go wrong with advice from Josh Bridges. I took a lot of tips from this video. I have also interviewed Jonne Koski and Tia Clair Toomey recently, both of whom regularly excel during the swimming events at The CrossFit Games. They both offered the same advice which is to always stay calm. Swimming is about efficiency of movement and good breathing technique. 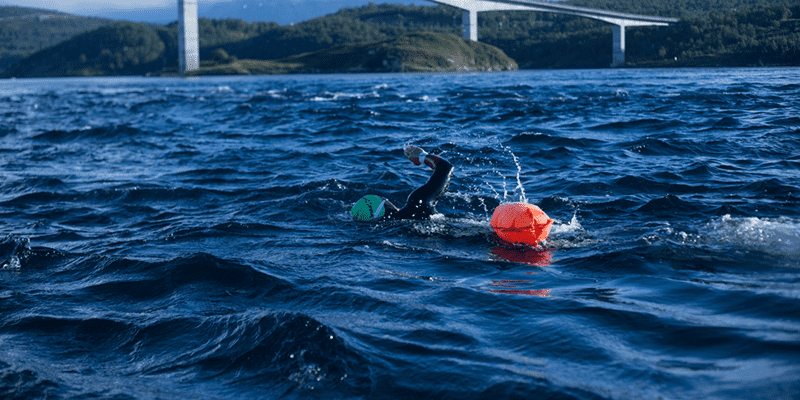 Get these both dialed in and you will be well on your way to performing well in any workout that involves swimming, or if you want to try any open water swimming adventures yourself.